At this time of year i always recall Herb Caen’s observation that Irish Coffee was the perfect Christmas beverage since it contained all four of the essential holiday food groups: alcohol, caffeine, sugar, and fat. Well, i’ve been eating fairly cautiously after that showdown at my internist’s on Christmas Eve, which does not mean that i haven’t been eating well. Oh no. Last week i discovered that directly across Market Street from my building there are four interesting restaurants. First, a little diner called It’s Tops that’s open only for breakfast and lunch and has been there since 1935. Nothing gourmet, but solid diner fare and a wonderfully funky ambiance since the decor, like the food, has not been updated. Then, clustered at the corner of Pearl Street, there are three restaurants new to me, all open only for dinner. First, a place named Destino that calls itself a “modern Latino bistro” which translates into a tapas menu with tiny portions of exquisite food. So far i’ve had only the seared scallops on a bed of avocado mousse flecked with Serrano ham, but it was splendid. And then, right on the corner, an izakaya place named Roku where i’ve yet to have a single thing to drink but have had some absolutely delicious breaded and fried baby octopus and an excellent miso soup. And finally, just around the corner on Pearl is a place called Sushi Zone that must be spectacular because every time i’ve looked in, it’s been packed. Hmmm. Gotta hit this one just at opening time to see what the fuss is about. On Tuesday of last week Andrew invited me for a lunch of rendang and prata. I think his rendang was the best curry dish i ever ate, and i quite liked the prata, a Malaysian bread somewhat like pita that was also very good. Last Monday i took Carol for her first visit to Basil, and sat there in delight as we marveled through the courses. Bowls of excellent Tom Ka Gai, a seared skirt steak salad seasoned like the Larb Gai everyone loves, and a roast duck and silver thread noodle dish that was sublime. I was going to have a glass of Thai iced coffee for dessert until we saw the dessert menu and decided to split a jasmine flavored chocolate mousse with a hazelnut cream topping. Oh, my, goodness. Eat at Basil soon. Since i’m not quite ready to cook for others in my new place, on last Tuesday i took Ian, Stephen, Jeff, and Andrew to Hoffman’s for a fab feast. First time there for Andrew and Ian, and of course they liked the place. Karen’s mussels cooked in wine with bit of red pepper and drizzled with an aioli were as fine as always, and i quite enjoy her take on a New England clam chowder. It’s such a warm and wonderful neighborhood restaurant, and Karen smuggled to our table a sublime holiday dessert she’s experimenting with, an eggnog crême brulée. Oh wow. On Wednesday, Christmas Eve, i took Jeff to Beso for dinner, where we had a dozen oysters in a spicy escabeche, the seared duck breast, and the seared bavette steak. For dessert, we split a chocolate brownie topped with two flavors of ice cream, salted caramel and chocolate. And that not being enough we adjourned to Hoffman’s for a nightcap and enjoyed a really festive evening there. Hoffman’s is currently my favorite restaurant, and everyone i’ve introduced it to has loved it. On Thursday, i drove over to Jeff’s in Marina Bay, where he’d cooked a Christmas dinner of Brussels sprouts picatta, potato salad, broiled stuffed mushrooms, and a chicken cordon bleu. Today i just nibbled around on healthy refrigerator food, some of last night’s mushrooms Jeff sent home with me along with a scoop of hummus i’d made last week and the last of a smoked salmon. And hey, it’s not as bad as it sounds because i weighed 140 lbs at the doctor’s office on Wednesday. Smaller portions of food have led to smaller portions of me. I just love this city in the winter between rains with the air crystalline and the sun coming in sideways. 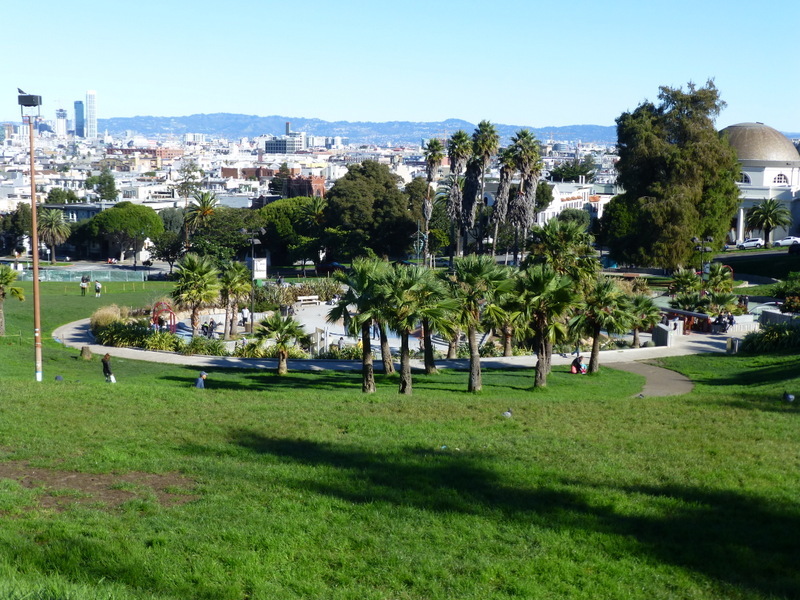 Here’s Dolores Park on Christmas Day.